Cathair in Alasca, SAM, is ea Utqiaġvik (IPA: ut.qe.ɑʁ.βik), ar a dtugtar Barrow go minic fós, an chathair is mó i mBuirg Fána Taobh Thuaidh. Tá an baile suite taobh thuaidh den Chiorcal Artach. Is é Utqiaġvik an 11ú lonnaíocht shibhialta is faide ó thuaidh ar domhan agus is é an chathair is faide ó thuaidh sna Stáit Aontaithe. Is é Rinn Barrow an pointe is faide ó thuaidh sa tír. Bhí 4,683 duine ina gcónaí ann sa bhliain 2000 agus 4,212 sa bhliain 2010. Thaispeánann suíomhanna seandálaíochta sa cheantar go raibh pobal Iñupiat timpeall Barrow chomh faide siar le AD 500. Ar an gcladach Artach, tá na hiarsmaí le feiceáil de 16 thulach a bhí ina dtithe fóid den chultúr Birnirk (a bhí ann thart ar AD 800). Táid suite ar airde atá beagán os cionn bharr láin agus iad i gcontúirt a chailliúna ag creimeadh na mara. Bhaist na Sasanaigh "Barrow" ar an áit sa bhliain 1825 in onóir an Ridire John Barrow ón Ailmiréalacht Ríoga. Thóg misinéirí Meiriceánacha eaglais Phreispitéarach ann sa bhliain 1888. Osclaíodh oifig phoist ann sa bhliain 1901, rud a chuaigh go mór leis an ainm "Barro" a chur i mbéal na ndaoine. 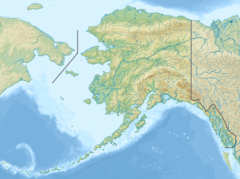 ↑ "Barrow's new name is its old one, Utqiaġvik. Local Iñupiaq leaders hope its use heals as it teaches.". Tugadh an leathanach seo cothrom le dáta an 10 Eanáir 2018 ag 05:50.